Memorialize your child’s name at MCHVF while donating to our school! Buying a personalized brick is a great way for your child to leave a lasting mark at MCHVF. Premium and regular bricks and are still available, details and pricing below. Regular Brick – 4″ x 8″ – up to 3 lines of lettering, including letters, numbers, characters, spaces (1 for $250 for 2 for $200 each). 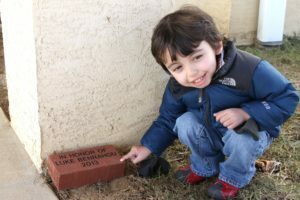 Premium Brick – 4″ x 8″ – first ten bricks on either side of the walkway at each end of the walkway – near the front door and near the drop-off point (1 for $350 or 2 for $300). To buy a brick, just click ‘Buy a Brick‘ link, fill out the form for each brick and send the form and payment to Gill Gutteridge’s attention to 1630 Thomas Road, Wayne, PA. 19087.